Discussion in 'Auto News' started by RocZX, Feb 4, 2019. Historic car maker Hispano Suiza will launch an electric grand tourer called the Carmen at the 2019 Geneva motor show, and it has now released the first image of its carbonfibre monocoque. The Spanish brand, which was famed for its luxury cars during the interwar period, has not launched a car since the Audi R8-based V10 Coupé in 2010. This followed a trio of concepts: the HS21 two-seater supercar of 2000, the K8 of 2001 and the HS21-GTS of 2002. The Carmen is named in recognition of Carmen Mateu, the granddaughter of Damià Mateu, one of Hispano Suiza's founders. The firm says the model will be built around a "super-stiff, hand-laid" carbonfibre monocoque. The Carmen was first teased in a sketch giving hints to its design. It will be fully electric and built in Barcelona, Spain, where Hispano Suiza was founded in 1904. Design details visible in the image suggest an aesthetic return to the company’s heavily streamlined interwar models; the company says it's inspired by the H6 Dubonnet Xenia, a coupé that was built in 1938. It will follow in the footsteps of other electric supercars showcased by small companies, such as China's Nio EP9 and the British-built Dendrobium D-1. Hispano Suiza has also confirmed that the construction of the Carmen will be handled by QEV Technologies, a firm that specialises in electric performance cars and works with the Mahindra Formula E team. Speaking about the heritage associated with the brand name, Miguel Suqué Mateu, great-grandson of one of the company’s founders, said: “When Hispano Suiza started, it built [an] electric car, but the prototype was never industrially manufactured. Now, 119 years later, in March 2019, Hispano Suiza has its first 100% electric car”. The project is backed by Grup Peralada, a Spanish conglomerate primarily focused on leisure and culture businesses. Probably a very expensive, unreachable for the common people, supercar. Again! The founding company (making electric cars) was started in 1898 and reincarnated as Hispano Suiza in 1902, seems like Autocar have the wrong year at 1906? Despite the brand’s 100-year history, Hispano Suiza remained dormant until recently. Earlier this month the Hispano Suiza Carmen electric grand tourer was teased ahead of its reveal at Geneva, drawing influence from the firm’s 1938 Dubonnet Xenia coupe. Historic Spanish coachbuilder Hispano Suiza has revealed its all-new supercar, the €2.2million Maguari HS1 GTC, ahead of its launch in spring this year. The rear-wheel-drive, mid-engined car is said to be fitted with a 1,070bhp twin-turbocharged V10 with electric compressors that's likely to be derived from the Lamborghini Huracan’s unit. The hefty power boost means 0-62mph is taken care of in just 2.8 seconds while top speed is electronically limited to 236mph. Ze Elephant, Michael88, McLaren and 2 others like this. The back of the car looks incredibly generic. The front of the car is absolutely hideous. They are obviously trying way too hard to make the car look aggressive. I'm sure it'll make a fine centerpiece for some eccentric billionaire's private collection. I mean, with a 1,000 horsepower engine and only rear wheel drive, they certainly aren't expecting anyone to be crazy enough to actually try and drive it. Some car designers just don't have the right imagination. I actually really like it. Like, a lot. Not to be confused with Hispano Suiza Automobile’s Maguari HS1 GTC, which is another same-named company also having their debut in Geneva, the Carmen is an electric grand tourer that combines “hypercar performance with exquisite luxury, painstaking craftsmanship and meticulous attention” to detail. The latest teaser image isn’t very revealing, but the company says the model is heavily influenced by the 1938 Hispano Suiza H6C Dubonnet Xenia which was commissioned by World War One fighter pilot André Dubonnet. Given his background in aviation, Dubonnet was interested in aerodynamics and this played in an important role in the styling of his car. 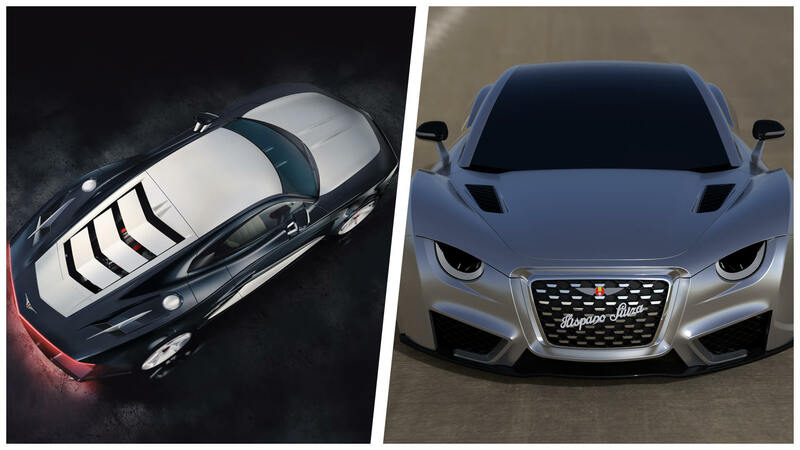 The same inspiration can be seen in the Carmen as Hispano Suiza says the vehicle will have an “aerodynamic teardrop profile” that has been modernized for the 2020’s. While only one new picture was released, the automaker said the Carmen will also have a trapezoidal chrome grille, circular headlights and a “floating” front splitter. We can also expect a drag coefficient of 0.325. Once the scissor doors are opened, drivers will find an upscale interior the pays tribute to classic Hispano Suiza models. The company says old school touches include an analogue clock, wood veneers and toggle switchgear. There will also be machined aluminum and a triangular gear selector that references the “art deco steel triangle” used on a number of classic models. The interior isn’t all retro as there will be two carbon composite seats which are covered in leather and Alcantara upholstery. Other modern touches including LED ambient lighting, a wireless smartphone charger and a 10.1-inch touchscreen infotainment system with Android Auto and Apple CarPlay. The Carmen has two electric motors and each one powers a rear wheel. This setup gives the model a combined output of 1,005 hp (750 kW / 1,019 PS). This should enable the car to accelerate from 0-62 mph (0-100 km/h) in less than three seconds before hitting a limited top speed of 155 mph (250 km/h). Electricity comes from an 80 kWh battery pack but, by the time production commences, the car could offer a capacity of up to 105 kWh. This could enable the model to travel more than 248 miles (400 km) on a single charge. Despite being an electric vehicle, the Carmen is pretty light as it uses a carbon fiber monocoque chassis that only weighs 430 lbs (195 kg). This helps the car to tip the scales at 3,725 lbs (1,690 kg). Production will be apparently be limited to 19 units and pricing starts at $1.7 (£1.2 / €1.5) million. The company is currently accepting orders the first deliveries are slated to begin in June of 2020. "Awkward" is the first word that springs to mind. It's almost as if it's based on an existing car, none of whose original body panels needed to be removed before fitting the new bodywork. NotThePrez, SiriusR and Joey D like this. This article was published by Andrew Evans (@Famine) on March 6th, 2019 in the Automotive News category. Ze Elephant, NotThePrez, TexRex and 1 other person like this. So it's not a football team? As I sort-of mention in the piece, there's actually far more companies with a Hispano Suiza interest. Switzerland's HS believe it has naming rights specifically for cars in some territories, but these don't include the USA or (insanely) Switzerland. That may explain why it's not there. Spain's HS believes it has the naming rights for anything it likes, and produced concept cars earlier than Switzerland's HS, but it appears to have naming rights for everything except vehicles. There's others too. And this all basically stems from the original HS setting up a second location in France, Spain nationalising the Spanish company during the Civil War then splitting it up and selling it in pieces, and France seizing the French company during WW2. Confusingly the first Mateu moved to France and the second and third ones lived there, but their claim is nothing to do with the French HS. ClydeYellow and VXR like this. Makes you wonder if the Hispano-Suiza name really has that much clout behind it in what is an already over-saturated supercar market. Like Borgward or Iso, it's not a brand that set the world on fire enough back in the day, and that day was a long, long time ago now, to warrant such fighting over. VXR and TexRex like this. I think that HS Cars probably should get the rights, considering it's part of the family. Himmel probably should try another name. Or maybe even a merger, but I'm no businessman. EngieDiesel, Mr Fahrenheit, DJTHEKING and 3 others like this. How/why did La Hispano Suiza Fábrica de Automóviles get changed to Hispano Suiza Cars, if the brand was also in the Mateu family? Why choose the word Cars for an automobile brand it makes it sound unprofessional? So the Carmen has hindquarters clearly inspired by cartoon gangster cars, there's no other explanation I can think of. Wasn't the "hispano-suiza" also the name of a british autocannon? Hispano Suiza Cars is part of LHSFA - which in turn is part of Mateu's allegedly more overriding concern "Club Peralada", a hotel, restaurant and casino chain. As for why... *shrug* but it seems to have been set up in November. "You're comparing yourself to me? You're not even good enough to be my fake." "I'll make you eat those words!" I'd say the Spanish one has a more credible claim to the name. But I hope we can have both coexist just to confuse everyone. What's up with that pointy stinger-like thingy in front of the car? Isn't that kinda dangerous?